Beam is a horizontal member of a structure. It carries its own load and imposed load and transfers them to its support (such as column or wall). Beam can be various types and can be made with various types of material. One of the most used material for beam is reinforced cement concrete. Reinforcement is a major item of a reinforced cement concrete beam. Deformed mild steel bar is the most used material as beam reinforcement. In this post I’ll share 13 terms about beam reinforcement which you should be familiar with as a construction supervisor. 1. Top Bar: This reinforcing bar is placed in the top of beam. It is also called compression reinforcement. 2. Bottom Bar: Bottom reinforcing bar is placed in the bottom of beam. It is also called tension reinforcement. 3. 2nd Layer Reinforcement: When one more layer of reinforcing bar is used on top of bottom bar or below the top bar that is called 2nd layer reinforcement. 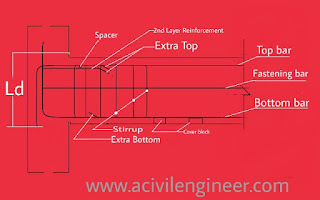 When using 2nd layer reinforcing bar in beam you should also use spacer between two layers of bar. 4. Extra Top Bar: Extra top bar is provided on supports and it doesn’t go through the beam. It is cut at one-third length of clear span of beam. 5. Extra Bottom Bar: This bar is provided at the bottom of beam. But this bar is not extended up to support. Beam section sheet of structural drawing shows where to cut the bar. 6. Stirrup: It is the shear reinforcement of the beam. It is provided around the longitudinal bars of the beam. It is also called ring. 7. Clear Cover: Clear cover or clear concrete cover or reinforcement cover, whatever you call this, it is the distance between the rebar surface and the nearest surface of the beam. For the beam above ground clear cover should not be less than 1½” and for the beam below ground clear cover should not be less than 2½” or whatever is suggested in the drawing by structural engineer. 8. Rebar: Rebar is the short form of reinforcing bar. In another word whatever steel reinforcement we use in the beam is called rebar. 9. Spacer: We provide a separator between two layers of bar that is called spacer. It should not be less than 1″. You can use 25mmø bar as a spacer. 10. Cover Block: Cover Block is used to keep up the clear cover of reinforcement. It can be pre-cast cement mortar block. 11. Chair: Chair is made with 10mmø or 12mmø MS rod. It is used to support the top layer of reinforcing bar specially in slab and footing. 12. Lap: when a reinforcing bar need to be extended in length then another reinforcing bar is joined by overlapping one another. That is the lap of reinforcement. The length maintained in overlap is called the lap length. Lap length should be suggested by code or by structural designer in drawing. 13. Development Length: The reinforcing bar of a rcc member should be embedded in concrete at both end of the member to prevent slipping possibility of the bar. It is done by providing hook to the bar and embed it in the concrete of the support. The total length of hook and embedded length is called development length. It is also called the anchoring of reinforcement. Development length is expressed by Ld. 14. Fastening Bar: If the beam depth is increased, some additional bars are used at the mid position of the beam-depth those are called Fastening bar. It is also called additional bar or face bar. 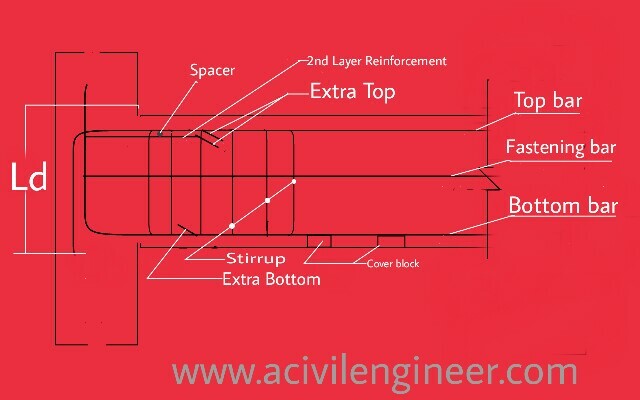 These are the terms about beam reinforcement you should be familiar with to work smoothly. Do you want to add any term in this list? Please share in comment below.